Originally published under the title "Turkey's 'Spies,' EU's 'Human Rights'." Turkish security forces inspect a truck that was smuggling weapons to Syria, January 19, 2014. On January 19, 2014, the Turkish Gendarmerie command in southern Turkey searched three trucks heading for Syria. 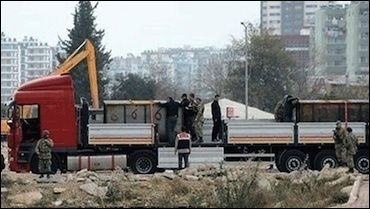 Accompanying the trucks were Turkish intelligence officers; the trucks had a bizarre cargo: In the first container, were 25-30 missiles or rockets and 10-15 crates loaded with ammunition; in the second, 20-25 missiles or rockets, 20-25 crates of mortar rounds and anti-aircraft ammunition in five or six sacks. The crates had markings in the Cyrillic alphabet. One of the drivers testified that the cargo had been loaded onto the trucks from a foreign airplane at Ankara's Esenboga Airport and that, "We carried similar loads several times before." It was evident that the arms were bound for jihadists fighting against Turkish President Recep Tayyip Erdogan's regional nemesis, Syrian President Bashar al-Assad. Nearly two years later, Erdogan would nearly confess to the arms shipments. "What does it matter if it [the cargo] was arms or not," he said on November 24. The incident still has grave consequences for some Turks. In May 2015, the secular daily newspaper Cumhuriyet published on its front page video and photographic evidence of arms deliveries by the Turkish intelligence services to Islamist groups in Syria. A month later, President Erdogan himself filed a criminal complaint against Cumhuriyet's editor-in-chief, the prominent journalist, Can Dundar, and the newspaper's Ankara bureau chief, Erdem Gul. In a public speech, Erdogan said: "He who ran this story will pay heavily for it." Cumhuriyet editor-in-chief, Can Dundar (right) and the paper's Ankara representative, Erdem Gul (left) are in jail on charges of being members of a terror organization, espionage, and revealing confidential documents. 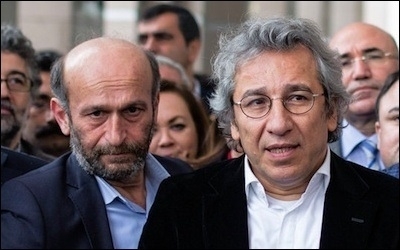 On November 26, the journalists Dundar and Gul went to an Istanbul prosecutor to testify. On the same day, they were arrested under a court order. Their lawyers' two appeals for their release were rejected. They are being charged with being members of a terrorist organization; espionage, and revealing state secrets. The prosecution has asked for life sentences for both journalists. Still having nerves that remained cool, Dundar mocked the judiciary by calling himself "an inexperienced spy." Really, why would a spy publish secret material in a newspaper instead of handing it over to his foreign controllers? The journalists' arrest left the entire world speechless. Several Western publications and institutions condemned their arrest. PEN International called for the immediate and unconditional release of both journalists and "once again called on the Turkish authorities to drop any other charges brought against Dundar for his legitimate expression as a journalist and political commentator." Turkey keeps on ridiculing itself while persecuting intellectuals and journalists whom the ruling Islamists passionately wish would not exist -- or think, or write. In the past, the European Union (EU) had some leverage on member candidate Turkey, but in recent years, relations between Ankara and Brussels have grown largely transactional. As Dundar and Gul completed their 11th day in solitary confinement, that human rights champion, the European Union, committed to push forward the process towards Turkish EU membership and open five accession chapters. To add insult to injury, the photo accompanying that news shows European Commission President Jean-Claude Juncker hugging Turkish Prime Minister Ahmet Davutoglu. Was the European President congratulating the Turkish prime minister for catching and locking up two spies? The EU, however, apparently does not give up on bolstering human rights and civil liberties in candidate Turkey -- mostly, it ridicules itself as Turkey does. On December 6, the EU said it will mark this year's Human Rights Day with movies addressing individual rights, human dignity and the experiences of a varied group of people, bringing 33 documentaries to audiences in Ankara. That was not even a joke. "In order to jointly reflect on these themes and highlight all the values which form the foundation of the European Union, we bring you the European Union Human Rights Film Days," reads an introductory catalogue from the EU's Turkey Delegation. Perhaps the European Commission's ambassador to Ankara should consider organizing a private screening in the prison cells hosting journalists Dundar and Gul? Part of the Gollum/Erdogan image for which Dr. Bilgin Ciftci is on trial in Turkey. Apart from arresting its most prominent journalists for being "spies" because they had run a scoop, Turkey, these days, has the attention of the international community also for tasking a court with determining if the former Hobbit Gollum (from The Lord of the Rings) is good or evil. 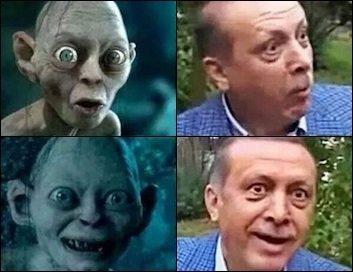 Turkish doctor Bilgin Ciftci posted photos on Twitter juxtaposing Gollum with Erdogan. He was immediately fired from the hospital where he worked. Then he was brought to court for insulting Erdogan, an offense punishable by up to four years in prison. His lawyers made a point about Gollum not necessarily being evil. And then events took an even more tragicomic turn. If the images are in fact the ones forming the basis of this Turkish lawsuit, we can state categorically: None of them feature the character known as Gollum. All of them are images of the character called Smeagol ... Smeagol is a joyful, sweet character. Smeagol does not lie, deceive, or attempt to manipulate others. He is not evil, conniving, or malicious -- these personality traits belong to Gollum, who should never be confused with Smeagol. Smeagol would never dream of wielding power over those weaker than himself. He is not a bully. In fact he's very loveable. This is why audiences all over the world have warmed to his character. Dr. Ciftci's trial has been adjourned until February 23, when his and Gollum's fate will be decided. All of that may sound surreal in saner parts of the world. In [EU candidate!] Turkey, they are just bitter facts of life. Burak Bekdil is an Ankara-based columnist for the Turkish paper Hurriyet Daily News and a fellow at the Middle East Forum.